For my thoughts on the previous Middle Earth films, click here. Lives in a hobbit hole and everybody knows him. It was with these words that Leonard Nimoy began The Ballad of Bilbo Baggins in which he recounted, in song, the whole of The Hobbit story in two minutes and twenty one seconds. Peter Jackson has taken five and a half hours to tell the same tale so far and he is only two thirds of the way through. Granted Spock wasn’t burdening his version with a great amount of detail but believe me, while Mr Jackson’s is the better adaptation he has still gone way too far the other way. Quite a lot was said about the director’s plans to split a relatively slender children’s book into three epic films when it was first announced a couple of years ago. Watching the first film, The Hobbit: An Unexpected Journey, I didn’t feel this was a problem but sitting through The Hobbit: The Desolation of Smaug I felt that by the end I’d probably missed a couple of my own birthdays. This film is way too long. Jackson, and dutifully Martin Freeman, have both said in interviews that they are fleshing out the story with detail from The Silmarillion and Tolkien’s extensive appendices which is true to a fair extent but that doesn’t explain why I had to watch endless scenes of a dragon soliloquising his way around an ancient mountain palace. All in all, I think two films would have been enough. That isn’t to say that I didn’t enjoy The Hobbit: The Desolation of Smaug. I fell in love with Middle-earth twelve years ago and am happy to be spending more time there even if this time I did feel a tiny bit homesick. Peter Jackson has created a totally immersive cinematic world and this film is as compelling and beautiful as we have come to expect from the previous instalments. There is one particular shot of Bilbo pushing his head out through some tree tops prompting a thousand sapphire butterflies to take flight into a coral coloured sky that cannot be described in words no matter how pretentious I try to be. Many of the problems that existed with Hobbit 1 remain. There is still no sense of jeopardy as the Dwarves get themselves into terrible scrapes but don’t die (although one of them is badly scraped this time) and there are too many of them for us to get to know them well. I couldn’t tell you which ones Dwalin, Bifur, Bombur, Oin, Gloin and Nori are and I’m not even sure that Ori was actually there half the time. Also, this fellowship are not as likeable as the mismatched group that led us through The Lord of the Rings Trilogy. Thorin continues to come across as an arrogant Aragorn and even Bilbo isn’t as nice as he was last time round, although there is a clear narrative reason for both of these. Good as these prequels are they clearly do not compare to the true masterpieces that preceded them and they work best when they refer to the events of those other films. There is a nice moment were Gimli gets a little shout out but more significant is Gandalf’s quest to confront The Necromancer. Once again the grey guy rushes straight into a situation he can’t handle and there are no moths or eagles to get him out of it this time, not yet at least. 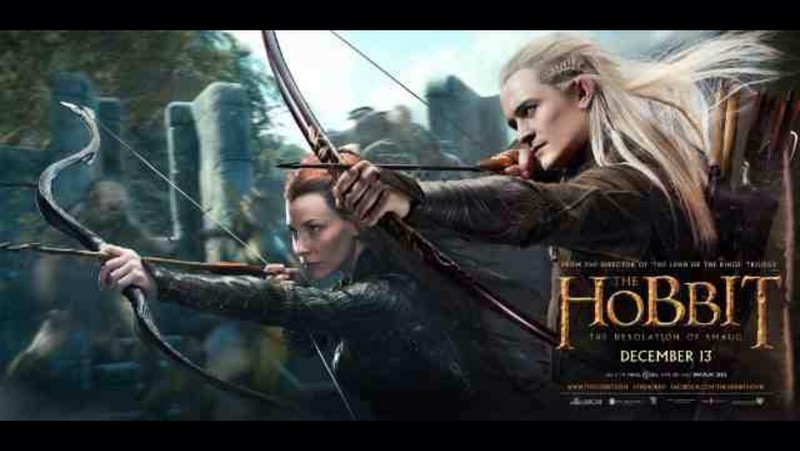 The most obvious nod to the previous films though, is the welcome return of Mr Legolas Greenleaf. Remember how we loved seeing him shooting things with his bow and arrow while surfing around on stuff? Well there is plenty of that going on here and it is great fun. He is possibly a little too much of a super-elf but that fits with a tone that is more childish than that of the first three movies, even if there are numerous orc decapitations. Legolas is not the only action elf at the party though because there is a concerted effort being made here to address the lack of women living in Tolkienland. Evangeline Lily’s character Touriel does not appear in the original book but fits very well in to this film. She certainly leaves a much greater impression that Arwen ever did and you don’t get the impression that this lady would ever suffer an internal struggle between love and duty. She seems to have no problem going after what she wants whether it be a pile of dead monster spiders, a load of skewered orcs or a dishy dwarf. It is a bit of a shame that this strong female character is saddled with a love story and there is supposed to be decades of ingrained hatred between dwarves and elves but Romeo and Juliet has always been my favourite Shakespeare so I can go with it. As well as two wizards, thirteen dwarves, two or three elves, numerous orcs, a nest of spiders and a werebear there are also some humans in the mix. Key among these are Stephen Fry, who is playing Stephen Fry, and his Wormtonguesque aide Alfrid. They don’t get a great deal of screen time but make the most of what they have. Incidentally, you know that annoying thing in films where two people start talking and are then seen in a totally different location without the conversation having moved on at all? Well, these guys do a doozy with the Master moving from bed and pyjamas to fully dressed on the stairs mid sentence. The main man though is Bard the Bowman and see if you can guess where his story is heading, haunted as he is, Aragorn style, by the failings of his ancestors? He is a good character but I don’t think I have seen events signposted with quite this little subtlety since Pretty Woman. It is a bit like seeing Bruce Willis pull a name tag off his toe in the early scenes of The Sixth Sense. It takes something away from the surprise of what comes later. Of course I could be wrong because we haven’t yet seen what comes later. (I’m not wrong, I’ve read the book.) Last week I objected to The Hunger Games: Catching Fire’s inability to come to a satisfactory resolution, unsurprisingly this is even worse. It doesn’t so much end on a cliffhanger as part of the way through a scene. That is often the problem with middle movies but as I said, two films probably would have been enough. Is this one for the kids ? The first Hobbit film felt like a kids film with adult levels of violence and dismemberment and this one is the same. 12A is the right classification but I wouldn’t take kids much younger than that recommended age. As with Hunger Games 2 it will depend on how used they are to seeing violence on screen but unlike Hunger Games 2, I don’t think having read the book will help.